BILLmanager is a management area for a service provider and a client area for his customers. To make their cooperation more comfortable and efficient BILLmanager provides three types of trigger mailing. 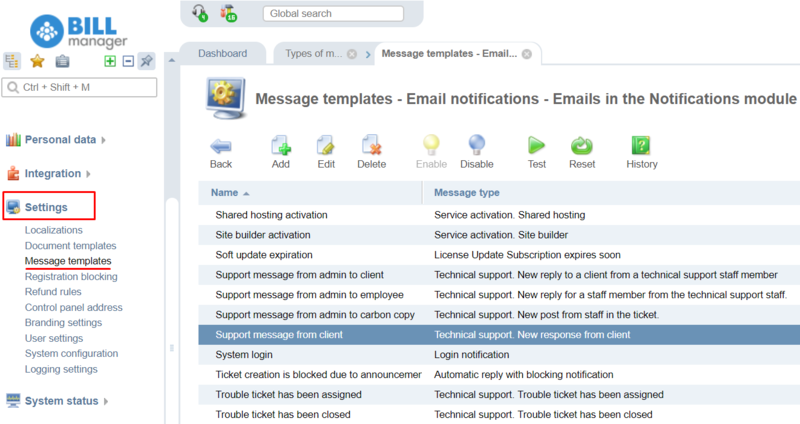 Notification templates are emails that your clients receive every time an event occurs on their accounts, such as automatic renewal of services, a new invoice or a response from the Support team. Notifications are sent automatically to clients and staff members. Newsletters from the “Marketing” section. You can send emails to a specific client group. The tool contains a native editor. You can customize the content and design according to your needs. Security notifications. There are two types of security notifications: GeoIP alerts and successful login notifications. They can be set up by the service provider, staff members, and customers. Every user will be informed about an unauthorized access to his account. Before you proceed with the mailing, you need to configure a mail gateway. In this article, we do not describe this process. For more information please refer to our Documentation or contact Technical support. BILLmanager includes more than 70 templates. The billing system sends a template to a client when a certain event occurs: the password is changed, his services get suspended or activated, an auto-payment is made, etc. A trigger configuration and a list of variables are described in the configuration file. We do not recommend that you modify them. an email is sent to the client. Every email contains static and variable data. 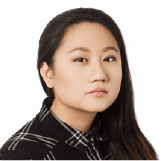 Static data are design elements, a text, links, etc. Variable data includes user personal information, such as ids of his accounts, licenses, tickets, IP addresses, and so on. 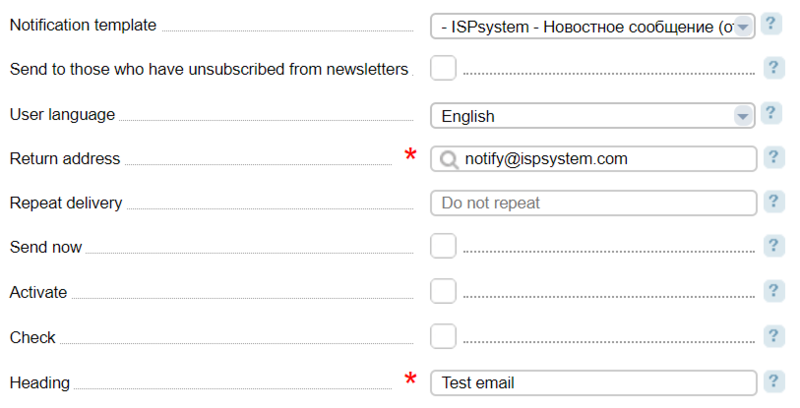 ISPmanager Lite activation email. On the left screenshot, you can see the variables that will be changed into required values. The screenshot on the right shows the generated email. Every template is an editable HTML-document. You can select its style, change fonts, edit texts, add images, and much more. You can modify any static information, but you cannot edit the triggers that are specified in the configuration file. You can find templates almost for all occasions: successful registration, suspension or activation of services, responses from your support staff, requests for additional configuration. If you sell SSL certificates, you can send emails with certificate files from the Certification Authorities to your customers. If you offer domain transfers, you can send emails upon successful domain transfer with all the instructions your users may need. By default, most templates are enabled. Even if you don’t sell site builders, the “Site builder activation” notification will be on. However, it won’t be sent to your users, as the corresponding processing module is not configured and you don’t have such service in BILLmanager. Thank you Capitan Obvious! Enable/disable/delete. If you don’t want to use an email you can turn it off (you can activate it again later if needed). To do so, select a template and click on Disable or Delete. Every template has a History where you can view a list of changes. Add. As a service provider, you can add an unlimited number of templates. Click on Add, fill out the form, and select a trigger from the drop-down menu. This feature is useful for those who have several projects in BILLmanager. Specify different projects and create different emails for the same templates. Several identical templates help differentiate similar services. For example, when customers buy various SSL certificates (DV, OV, or EV) they will receive different emails. In the activation email for EV SSL certificates from Comodo, we ask our clients to pay attention to the DUNS verification procedure. You can select the templates in a tariff plan configuration form. On the left screenshot, you can see a DV SSL certificate activation email. 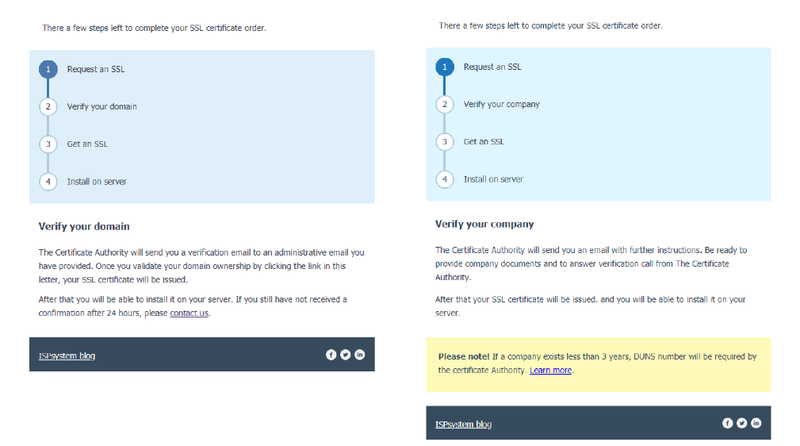 On the right, you see the activation emails for the EV SSL certificate with additional information displayed in yellow. Such notifications are not sent automatically. You have more flexible options for spamming your needs. This is a great tool, but do not overdo. To create a new mailing navigate to Marketing - Mass mail, click Add, and select a user segment. Please note: you need to add a segment before you create a new mass mail. Fill out the forms and create an email. The Mass mail contains an easy to use native HTML editor that helps you add new content and links, edit tables, and perform other operations. The email subject corresponds to the “Header” field (see the screenshot above). When you create a new mass mail this will be a mandatory field. 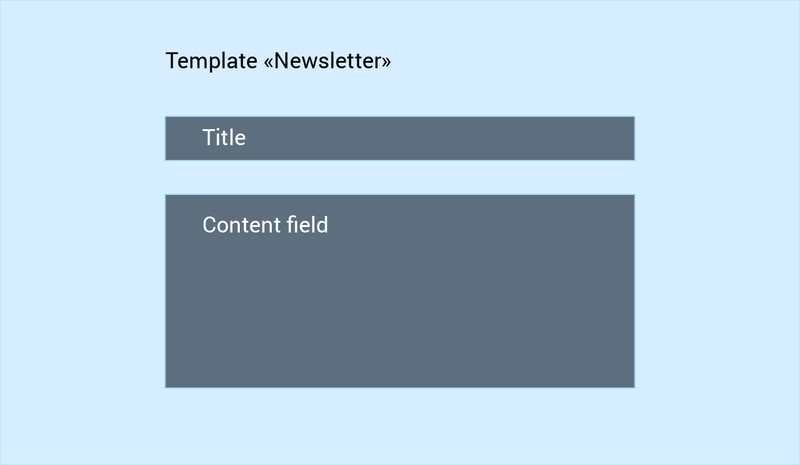 You need to edit the header style in the template “Newsletter”. The content field () is a text that you add in the editor. The content will be added into the template, that’s why we recommend that you test your emails to make sure they are displayed correctly. To ensure better security you can set up automatic emails from the GeoIP module, authentication, and DNSSEC notifications. Go to User settings and enter an email. This email can differ from your main email, and you need to verify it as well. 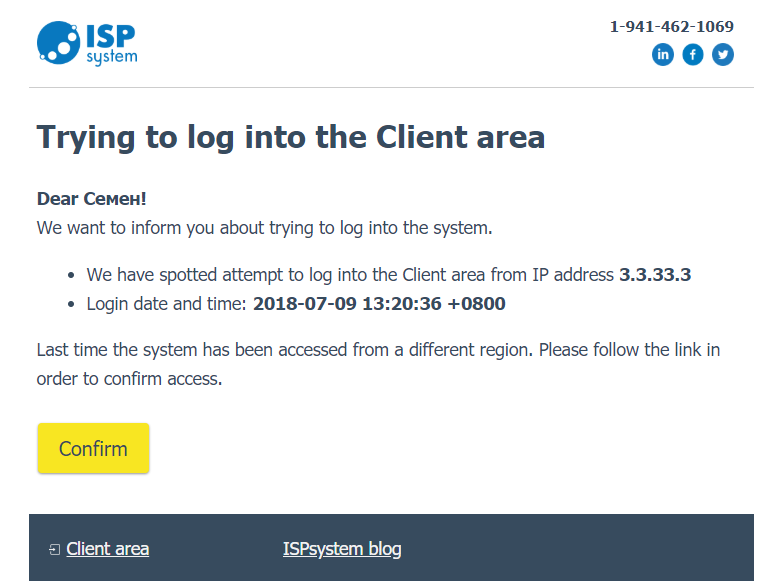 GeoIP notifications are sent every time you log into your client area and enters an IP address. A successful notification is sent when you enter your client area. In our next article, we will tell you how to configure email templates, use variables, and apply the “Unsubscribe” button if your customers don’t want to receive notifications from BILLmanager. The guide will help services providers customize email templates according to their needs.